Where do I Vote in El Dorado County? 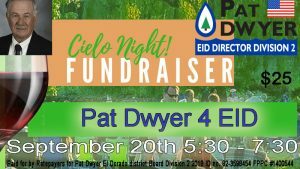 A night at Cielo Estates for Pat Dwyer 4 EID for mailers to get the vote to Stop the Water Tax, Support Farmers, protect our Rural environment, and control Rates for ALL ratepayers. Sept. 20th 5:30 p.m. to 7:30 p.m.
Another View: Will Apple Hill family farms survive?